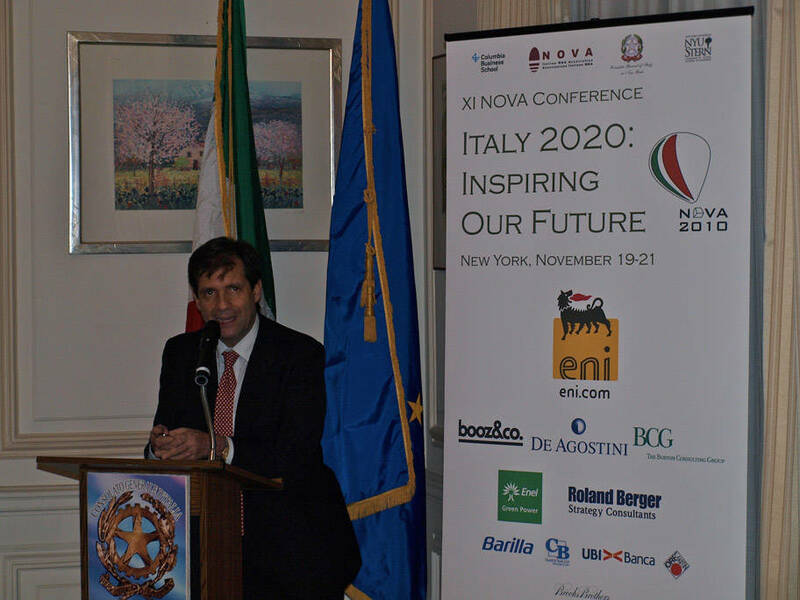 The core of 11th NOVA Conference, which every year brings together top business leaders and more than 200 MBAs, PhDs and alumni from the major North American business schools, was Italy's evolution during the next 10 years and the main trends that will affect the country’s growth. 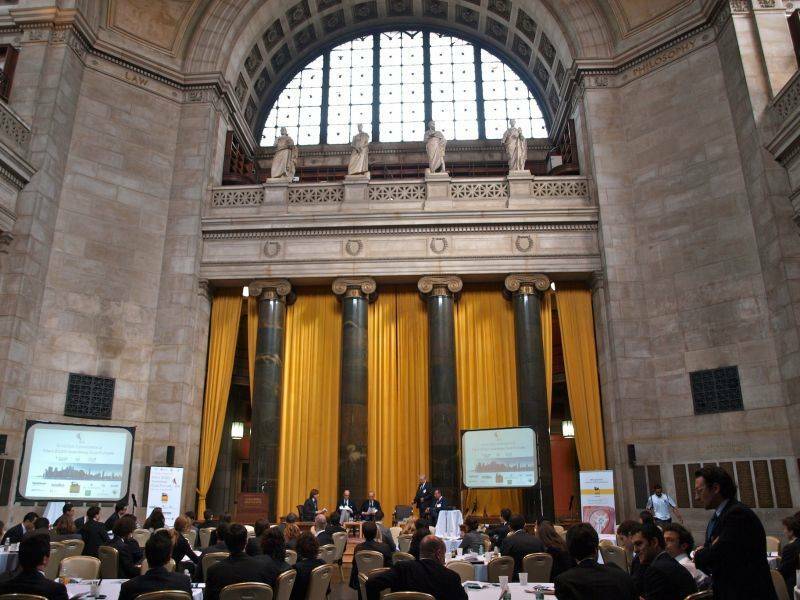 It was held in three striking locations throughout New York City, very different in charm, history and culture, yet perfect settings for the symposium. The Consulate General of Italy was the location for the welcome cocktail. "This door will always be open for you," said Hon. Francesco Maria Talò, Consul General of Italy, during his speech, "because Italian institutions are here to help students like you." The following day, at Columbia Business School, Marco Alberti, Deputy Consul of Italy, with a motivating speech, opened the works of the symposium then left the stage to Marco Vitale, president of the Fondo Italiano di Investimento, whose address exuded a good dose of optimism for the Italian economy. "The Italian manufacturing Industry has not been damaged by this crisis," he stressed, "differently from other European countries, it has been able to maintain a a constant level of productivity during the crisis." The conference was articulated in five panels: Thought in Italy, Growth in Italy, Financial New Normal, International Diversification and M&A and Private Equity. Alessio Magnavacca, MBA student at Columbia Business School, who with Nunzio di Giacomo was in charge of choosing the five topics for discussion, remarked the unconventional approach of the key note speakers, who instead of underscoring the consequences of the crisis, chose an optimistic lens. Most of them delved into the opportunities of growth the Italian economy is faced with, backing their assertions with statistical data. gance, food and fashion." Paolo Zegna, Chairman of Ermenegildo Zegna Group, stressed that in a country where most companies are small\medium sized the key to competitiveness is increasing the dimension of the businesses. Among the other lecturers were Marco Vitale and Fernando Napolitano. During the Growth in Italy panel, an excerpt from the movie "The Ruling Class" (Peter Medak,1972) was shown by Tito Boeri, Professor at Bocconi University; it is a scene in which the protagonist, played by Peter O'Toole, lifts up a table with the power of his thought. "As Peter O'Toole did with that table," Boeri commented, "the Italian ruling class has the opportunity to raise the economy after the crisis." He then stressed how important it is in order to reach a real growth to bring about a change in the political and managerial class. Also in the panel, Maria Chiara Carrozza, Director of the Scuola Superiore Sant'Anna, and Paolo Emilio Signorini, Managing Director of the Dipartimento Interministeriale Programmazione Economica (DIPE). Financial New Normal, the third and last discussion of the day, focused on the impact that the crisis has had on the Italian financial system. The discussion also touched upon the importance of corporate size as an incentive to being competitive in the current market. Among the speakers were Roberto Crapelli, Partner and Managing Director of Roland Berger Stategy Consultans, Victor Massiah, CEO of UBI Banca and Arrigo Sadun, Executive Director of the International Monetary Fund. In the evening the convention's networking opportunities continued during a Gala Dinner at the renowned 583 Park Avenue. On the second and final day of the conference, the attendees moved from the Upper West Side to one of the most characteristic New York neighborhoods, Greenwich Village. NYU Stern Business School opened the doors of its Paulson Auditorium to a group of famed lecturers who discussed the subjects of International Diversification and M&A and Private Equity. Paolo Borzatta, Senior Principal of The European House-Ambrosetti, Claudio Costamagna, Chairman of CC&Soci and Lorenzo Pellicioli, CEO of De Agostini were the three speakers for the Inernational Diversification panel. Differently from the previous panelists, they curbed the optimism about the Italian economy. They pointed out a lack of international investments by the Italian companies, lamenting above all a scarce presence in the emerging markets, such as Asia and Africa. Similar limits were discussed during the last panel by Maurizio Dallocchio, Professor at Bocconi University, Luigi de Vecchi, Managing Director of Credit Suisse, Francesco Pavoni, Partner & Managing Director of The Boston Consulting Group and Claudio Sposito, Chairman & CEO of Clessidra SGR. The four speakers seemed to agree on the small number of deals in the Merge & Aquisition Italian market. "M&A could be the solution for most companies' problems," Maurizio Dallocchio said. The poor investment in Research & Development, for example, which given the small size of Italian companies cannot be afforded, could be solved through Merge & Aquisition. Stefano Passina, Executive Chairman of Alliance Boots, closed the two-day NOVA Conference with a speech of encouragement. "All we Italians have in our blood a natural tendency to be entrepreneurs" he said to the MBA Italian students in the audience, encouraging them not only to think about being hired by companies but to go back to Italy to open their own businesses. For Alessio Magnavacca, an MBA student himself, going back is not always possible. "MBA students, like any other talented people, should go where there are opportunities," he said, but to make Italy more appealing, he continued "Fernando Napolitano proposed to NOVA the development of a project to bring Italian MBA students back for a summer position in a medium sized company. With NOVA helping to fill the salary gap between the offer and the demand." The NOVA Conference is over and we can safely say it was a good injection of optimism: as most of the speakers reminded us, there is always an opportunity of growth after a crisis. What matters is taking advantage of that possibility.